According to James Hillman, the experience of psychological inwardness and depth, is the Greek goddess Hestia’s domain. I couldn’t be more in agreement with Hillman’s thesis. I have referenced this idea in greater detail in a prior Word Press blog. At the present time, and throughout the next year, the Greek goddess Hestia will reside in the astrological sign of Virgo, where I think she will be most comfortable. While there, she will coexist, alongside Jupiter, aka her Greek cousin Zeus, King of Mount Olympus. Hestia’s influence expects to play a large role during astrological Jupiter’s current, year long tenure there. I have always felt mixed as to Virgo’s mysterious, astrological rulership. In part it fits, that she is close to Ceres, asteroid goddess of the grain. Also in the running, is her closeness to the mercurial aspects of Hermes, guide of souls. All are certainly of fine minds, as is Hestia herself. Yet, more and more I find Hestia, Greek virgin goddess of the hearth, to be the one I see as intimately, soulfully connected to, and at home in, the astrological sign of Virgo. Now that Hestia’s cousin Zeus, a.k.a. the astrological Jupiter, king of the Greek pantheon, has taken up residence alongside Hestia in the sign of Virgo, both will coexist within, that deep, deep inner, spiritual domain, where, as I recall, Hestia, once made a lifelong promise to Zeus, to tend what I imagine has been and continues to be one helluva fire! For sure the language of Greek mythology fused with astrological symbolism, can be a bit confusing when mixed together. Just take my word for it, that as one becomes more familiar with each, their pairing up and overlap will be automatic and make sense. For now, just hang on to this–Earthy Virgo and fiery Sag share spiritual leanings that have different manifestations. They are kin, cousins I believe, kissin’, not likely. Jupiter’s dance card is overflowing with other options. As for Hestia, well to be honest, word has it that she’s still, shall we say pure? With Jupiter’s transit now in Virgo, our task will be to somehow find that place within Virgo’s, Hestian, earthy, fiery, domain of endless depth, that can couple up harmoniously– and perhaps even magically–with cousin, Zeus. Together they can go about the business of tempering the Jovian fire that often leads to endless flights of fancy, and that on occasion, provides fuel for mania. We’re talking refinement here. That said, there is no more exciting sign, in my view, than Sagittarius, well at least initially! No one has ever been able to fly me to the moon better than Frank Sinatra, a well-loved sag! The astrological element of fire can be and is very exciting. However, astrological Jupiter now in Virgo, is up for some refinement. And heck, what’s a little refinement between cousins? So what can happen, when the element of fire pairs up with the element of earth? Despite what at first may seem like an incongruous pairing, something within me is oddly enough, incredibly drawn and turned on by the pairing of these two deities, Hestia and Zeus, aka astrological Virgo and Sag! Somehow, despite their naturally, divergent, astropsychological perspectives, personalities and style of meeting human needs, they are currently and for one year’s time, in this thing together. Might they be just what the other needs to compliment, those places within each, where there is either too much conversational over-extension, and/or, too much emotional conservation, carefulness, delicacy? Could Jupiter’s current visitation in Virgo, temper the Hestian tendency toward timidity, shyness, and the need to overly plan in the interests of safety? Hestia’s pure, virginal domain just might cool the heels of mania and grandiosity often characteristic of those grandiose, Jupiterian, puer flights into a world of endless ideas often unable to find and /or experience consummation! Either way, for the entire next year, fiery Jupiter goes about the business of taking up residence within Hestia’s earthy—Air B&B! Their co-existence during this transit does indeed promise an offering of significant proportions by the end of Jupiter’s tenure there! In this regard, I have offered up my own sculpture entitled “Offering,” as both referee and mediator, to make sure things don’t get out of hand completely. This I hope will allow temperate Virgo to fan the boundless flame of Sagittarian ideas just enough to not only keep things interesting, but perhaps, just perhaps, to also lead us to another, newer way, in which we might urge that magically, fire-infused archer, to take on some of the more sustainable, perspectives, qualities, or form typical of a Hestian worldview. As Hestia and Zeus move in transit through astrological Virgo, I make this hopeful proposal: I would like to see Hestia’s ‘offering‘ as a call to Jupiter to forge an opening, a letting-go, a joining, a kind of wedding, whereby those deep, deep places of Hestian inwardness and reflection– become exquisitely, intimately infused with a sense of optimistic, Jupiterian, belief that will ultimately be passed on to us as a global collective. O.K! I’ll say it honestly, more definitively, with what I hope is greater clarity: It is my offering (my Sagittarian-like, ultimate fantasy) that the unique blending of Virgo and Sag becomes the new, fertile ground (Virgo) out of which global healing (Sagittarius) may be born. Have I over shot it? I certainly hope so! What will your offering to both these mythic, astropsychological deities be? Here I sit here on Father’s Day reviewing proofs from our recently published book, Images of Soul: Reimagining Astrology. Our book’s central thesis resonates and concurs in part, with those seminal ideas postulated by the late James Hillman, in his magnificent red book, The Soul’s Code. In our little red book, Images of Soul: Reimagining Astrology, co-authored by myself and Marriage, Family Therapist, Evolutionary astrologer, writer, editor and poet, Hadley Fitzgerald, we’ve followed Hillman when he postulates, that each of us is born with a metaphorical acorn that serves as carrier and container of our soul’s codes. To this possibility, Hadley and I have added the notion that also within that container, i.e., horoscope, there is a map and timing mechanism of one’s soul’s code, calling and fate. The graphic (timing mechanism) on our book’s cover which was discovered online was created by a photographer who photographed an acorn and assembled the tiny timing mechanism, made of antique watch parts, which he then placed within the acorn. The minute Hadley laid eyes on it, she knew the visual image inside that acorn was everything we were in the process of writing about. Our graphic’s person enclosed the image within a circle and we had the workings of a horoscope! It is fitting on this Father’s Day, to acknowledge Hillman’s role in our book’s creation and development. After all, his ideas about an acorn-driven theory of fate and soul have not only in-part fertilized and fathered our book’s thesis, but his work has also prompted us to reimagine and amplify our professional lives as astrological psychotherapists in profoundly new and exciting ways. For the most part, our book finds agreement with Hillman when he postulates, that we each have within us a metaphorical acorn destined to become a particular type of oak tree. As I understand it, this idea functions in tandem metaphorically with the notion that we each have a particular life, or calling designed and meant especially for us. Hillman notes, that there is a Daimon, or guide in charge of each of each of our destinies. We’ve aligned and analogized our thinking with this notion, added one factor, and offer this as possibility to our readers. The container and timing mechanism of and for this pattern of destiny is contained within, and symbolized by, one’s birth astrological horoscope, and it’s transits and progressions. This simply means we are enabled then, to study the soul’s movement in and through time. By studying these astrological indicators of the soul’s movement through time, whether within one astrological counseling session, or the ongoing process of psychotherapy, one may track, conjecture, hypothesize and/or describe the fate and life of one’s soul astropsychologically, in an evolutionary sense, i.e., from lifetime to lifetime, or simply within and during the process of one life at a time. It is fitting then for me, on this Father’s Day, to again acknowledge Hillman’s role in our book’s development. After all, haven’t his ideas about an acorn-driven theory of fate, in part, fathered our book’s thesis in what for us has been and continues to be, a new and exciting way? As I write, a feeling of sadness emanates from my heart and feels as if it is about to physically spread over my entire body. I inspect my chest expecting to see a manifestation of some kind of bright, red rash. Despite the increased continued sensation of tingling nothing actual appears on the surface of my skin. My emotional heart tells me that I’ve entered into a state of grief. “For what or for whom do I grieve,” I ask out loud as if speaking to the air? The posture of my body crumples. I find and take refuge in the well-cushioned corner of the couch. I’m flooded with a fusion of grief, loss and gratitude, to and for the world, that has opened inside of and before me. I am especially aware in this moment of the gratitude I feel for having discovered the exquisitely soulful products of Hillman’s groundbreaking work written and imagined by him during his physical life. And now that he is gone and no longer physically here, I have the good fortune of still being able to partake of the body of work that is now his bequest to us all. Do I love Jung? Is he eternally brilliant, and amazing? Of course! Seeing through to psyche via Jung’s Collected Works, his Red Book art and text is an experience that I /we may not see the likes of ever again. Sometimes I sit and stare at Jung’s Red Book and could swear I see it moving with a kind of rhythmic pulsation. I can imagine Jung easily. He is the ultimate. I’ve even had imaginal dialogues with him in which he is referred to as psyche’s grandfather! In contrast, for over twenty-five years I’ve experienced Hillman’s living, physical presence, heard his lectures, read his books over and over from 1979 to the present. I’ve spoken with him, literally and imaginally, even been his dinner partner on one occasion, as a gift given to me by a beloved mutual friend on this friend’s sixtieth birthday! 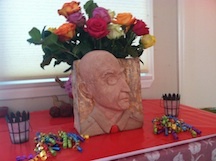 And more recently, as another way of embodying his meaning, I‘ve sculpted Hillman’s face in bas relief, complete with his occasional trade-mark khaki military-style shirt and eye-catching reddish tie, as shown here in this blog. And lastly, sadly, gratefully, I attended the moving memorial so exquisitely orchestrated by his widow Margo Mclean, in Manhattan. Those important, real-life events will remain ever imprinted in my memory. So why the tears on this Father’s Day weekend? I cannot quite describe what is missing now, other than the obvious, but I’ll take a stab at it. Perhaps it is the alchemy that Hillman’s physical presence on this planet engendered for me that I so miss and that I have transferred onto him as carrier of same. The undercurrent within my psyche of his absence in our world seems to bubble up and overflow every once in a while, until it happens to have landed this year, on what better day, than Father’s Day weekend? Astrologically, Hillman’s Chronos/Saturn, i.e., his (astro-mythological father) conjoins my astrological Hermes/ Mercury (teaching/learning – soul guide, communication/Trickster). Both gods are placed in the in-depth, mysterious, hold on to the bitter end depth psychological sign of Scorpio. This astrological twosome of Chronos/Saturn holding hands tightly with Hermes/Mercury is a configuration that not only deepens any psychological investigation, but in my case, also resides and has its genesis in my own horoscope’s Hades/Pluto’s mysteriously, unrelenting Scorpionic realm. The Hermes person (me) takes direction in terms of her learning, from the Saturn/Chronos astrological father figure, i.e. (Hillman)! One cannot help but ask, what better dynamic then, than to lead, inspire, teach, be shown the ropes and other ways in which to see through to those Hades’ depths out of and from which puer-like images of soul generated by a mythic figure such as (Hermes) emerge? The esteemed author/astrologer/educator Richard Tarnas, might say that I’m in the grip of a major astro/psychological archetypal complex! And… he would be correct! Yes, this archetypal astrological union of Father (Saturn) teacher Mercury (Hermes) communicator, & guide of souls, together within the in-depth Scorpionic land of Hades /Pluto satisfies Tarnas’ wonderful definition of the astrological term “archetypal complex” like nobody’s business. And honestly, I wouldn’t have it any other way. Now, for a bit of plain English translation for those not so astrologically inclined. Hillman’s ideas, words, writing, humor, and originations from the depths, are all metaphorical instruments and manifestations of Hermes. How very lucky am I to be endlessly guided, fathered and taught by these. Hillman was/is my ultimate, Saturnian, senexy, father figure and teacher, with a sprinkling of Puer (eternal youth) thrown in for good seasoning! His Hades-based (Scorpionic), fatherly (Saturnine) ideas/teachings, ignite my own Hermetic, Scorpionic Mercury, allowing for seemingly endless excursions into and out of Hades’/Pluto’s underworld, and Scorpionic realm of soul. For a Scorpio, such as myself, despite or perhaps because, of that exquisite agony, it doesn’t get any better than that! It is appropriate, then, is it not, to cry occasionally over and during the activation of such psychological depths? Doesn’t it makes sense, that every once in a while, and most especially on Father’s Day, that I, this eternally, psychologically and personally, fatherless daughter currently resisting her way to Cronehood, react to those impulses sent to her from the underworld land of Hades/Pluto? Astrological images of soul are gifts from the underworld. They are borne on the wings of dark angels and delivered by the winged god, Hermes/Mercury. They originate from a dream-laden, dark, mysterious, invisible realm and have their origins and being in psychic life. Our engagement with them affords clues to our fate, our calling, our souls. To this time-weary, eccentric, psychotherapist/astrologer, recently referred to in passing by a colleague as “that shrink who sculpts,” these Hillmanian, imaginal gifts by proxy are welcome on Father’s Day or any day. About a year ago, I noticed some activity within my own horoscope involving Hestia, that mythic, spiritual, virginal, asteroid goddess of the hearth. Curious about what this might mean, I researched the asteroid Hestia’s mythical story, while observing her astrological movement and activity within my own horoscope. By way of explanation, asteroids are those astronomical, allegedly less significant points within a horoscope, often named for mythical figures. Don’t be fooled as to their significance. Their symbolic existence and activity pulls some heavy weight and lands some mighty punches! What I’d conjectured after careful research, thought and reflection, about Hestia’s reawakened activity and current place in the hidden spotlight of my own life, was that some emergent, spiritual, inner and/or outer deeply psychological experience, perhaps referencing religious, and/or mythic figures was about to assume center stage. Hestia did not disappoint. Before too long, a book, entitled Images of Soul-Reimagining Astrology, coauthored by myself and Evolutionary Astrologer and Marriage, Family Therapist Hadley Fitzgerald began taking shape, and is now available for online purchase through Amazon books. Given the premise within my original doctoral thesis positing image=psyche=horoscope, it makes perfect sense to me, that if, as Hillman has noted, that Hestia indeed governs “the inner psychic structure,”(4) and if, as I’ve just premised that image = psyche = horoscope, then can’t one reasonably assume that Hestia is also the driving mythic, presence behind and within the astrological horoscope? Who better than this silent goddess—whom Hillman has described as “governing the inner” depths—to act as both prompter and guide, in our own discovery of psyche and horoscope’s mysterious calling and trajectory? And who better than Hestia, to sit silent watch over one’s horoscope, acorn, and curious inner timepiece? All of which must reside within the exploratory land of a depth, archetypal astrology! During this Hestian surge, I completed two sculptures with archetypal, spiritual and/or visual religious meanings! 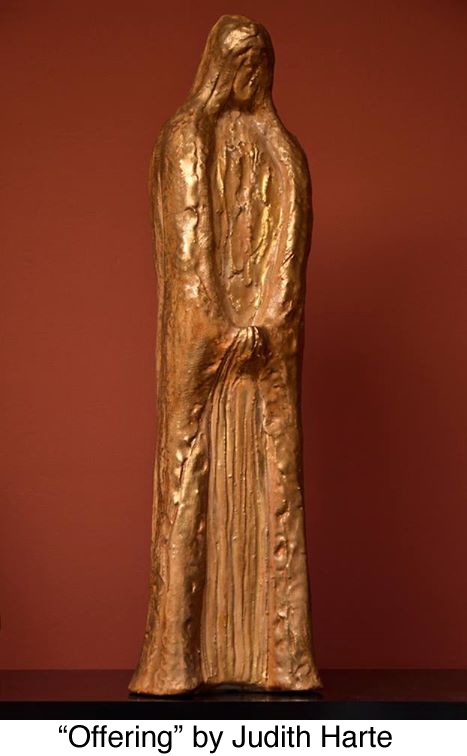 One piece, entitled Padre de mi Alma, or Father of My Soul, is of an actual priest and personal friend, and is my first bronze portrait. The other, entitled Offering is a sculpture of a spiritual figure featured in a prior Depth Psychology Alliance online publication, and also in our book Images of Soul: Reimagining Astrology. I have been thoroughly embraced by and cloistered with(in)Hestia’s divine, spiritual leanings! 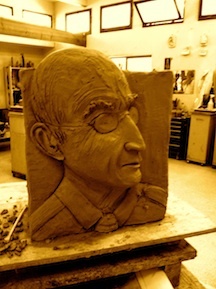 These and other sculptures will be featured under this blog’s Sculpture heading. In keeping with this theme of Hestian offerings, I invite readers to leave any and all of their written offerings and reflections, at what I now think of as my blog’s Hestian door, imaginal hearth and/or altar. This is my way of gathering and encouraging others to honor Hestia’s eternal, spiritual flame, in their own lives. I will make every effort to respond to each and every post. James Hillman, Random House, Inc.
At my request, someone emailed me a section from their in process autobiography. Curious and interested, I wanted to sniff the flavor of its essence and writing style. After reading a small, poignant selection of the author’s work, I responded hastily to what I’d read. In my response, I’d used the terms soul print, and soul imprint interchangeably. This term foreign to Ed its author, was frankly upon further reflection, also rather foreign to me. So, when he wrote back asking, “What is a soul print or imprint?” I, prompted and moved by his question, my own curiosity and the concurrent background sounds of a howling coyote enjoying a much coveted kill outside my tiny canyon home, proceeded to offer up an answer! As so often happens, in unintentional Talmudic style, Ed’s question led to other questions, as my own need to craft a less cavalier, more thoughtful, response and definition of greater depth encompassed me. As I worked to further mine the meaning of the term soul imprint, it became clear that my request to read Ed’s work and his curious question, were unintended gifts. With the term soul, currently red hot and growing hotter with each day, commercially, collectively and in psycho-spiritual circles, it is no surprise that my use of the phrase, soul print, thrown out so cavalierly by me across the internet miles, clearly warranted, if not further thought, then at the very least, an exploration of greater clarification and depth. I was interested in following through on this exploration, but my immediate answer to Ed’s request for a clearer definition of the term soul print would have to wait. Or, if not wait, then be further defined by my efforts to seek a clear definition of the term. Not exactly comfortable I’m sure, for the quick response often sought by an Aries! However, I do thank Ed for the provocation, elicited by his question! And so I riffed on it and riffed on it until I felt inklings of the satisfaction that comes with having riffed just long enough so that at the very least, as in the Talmudic tradition, further questions while not completely answered have at least been provoked. There’s no holding back or denying the impact that being such an integral and intimate part of the terminal ending of a beloved’s only partially lived life, must’ve had upon Ed in his role as caretaker of his terminally ill partner. I imagine that for Ed, the witnessing of, caring for, and final loss of a piece of himself and of his life, at the very least, qualified as having left a significant soul print in its own right. One might conjecture, that a terminal experience such as that, had penetrated to the very matrix of Ed’s own life and very soul. Yet, a soul print made and left by the hand of a child in wet cement, also conjures the as yet unlived possibility of the kind that only a tiny hand print left by a small child in wet cement might evoke. In fact, both the loss of Ed’s friend and lover, and that of the as yet undeveloped hand print of a small child may both be considered to be mysterious images of as yet unlived possibilities. One, never to be lived, the other, a tiny, presumably living hand, so very much alive and waiting in life’s wings, for actualization. Other questions arose within me as I reflected upon and contemplated this notion of soul prints. For example, is the capacity to create and/or to experience the living out and unfolding of soul imprints as given at or with birth carried within the physiological DNA until fleshed out by the experiences of our lives, and of which my friend Ed’s experience is but one example? There is no doubt that it fits as a part of his nature, his autobiography, as well as that of his departed friend. What is one to do with this kind of experience? Ed has certainly personally carried it forward into his life’s work with the dying. Are their different soul imprint questions and issues at different stages of life? How does one live from here on out after a life-changing event? What impact, i,e, soul print/imprint, has, does, or will trauma make upon one’s biography? Poetic? Literal? Psychological? Physiological? Is the impact, if there is one, ever complete in and by its effect(s)? After a powerful experience, is one called upon to take from and give back to life differently? And/or to be in this life more fully, perhaps even more courageously, while allowing and awaiting the unlived, untried, sleeping dimensions of oneself to awaken? What are psyche’s (soul’s) messages (imprints) in the here and now? Do they translate only into rich, unique, though often difficult, life experiences? If so, what kind? Will something of value continue to emerge from Ed’s deceased friend, even now while Ed is still alive? Does the living on of their experience continue? If so, how, and where? What is the special facet of the autobiographical imagination that makes this experience, this soul imprint, their soul imprint unique? This calling may be further indentified/articulated in and by the patterns in one’s astrological horoscope such as has been postulated by Hadley Fitzgerald and myself in our recently released publication, Images of Soul: Reimagining Astrology. The archetypal, astrological horoscope itself, in its entirety, with its various themes, that when taken together become one large soul imprint and/or container out of which smaller soul imprints may be created, lived and when appropriate released into the world? Possess certain unique qualities, gifts, and/or talents, that like a finger print, belong to, identify and represent only you. Are any pro, or con, life-altering, life-changing experience or set of experiences that throughout the course of one’s lifetime, could be said to be responsible in-part for the transformation and/or the course of one’s life. Is there an aspect of your psyche’s DNA that you would, if given the chance, designate as your eternal soul print or imprint? And if, given the vote, how would you like this imprint to be remembered, and/or identified at the soul level?